Deliver some smiles this year when you take a moment to send a hand-stamped Valentine card to those in your life. 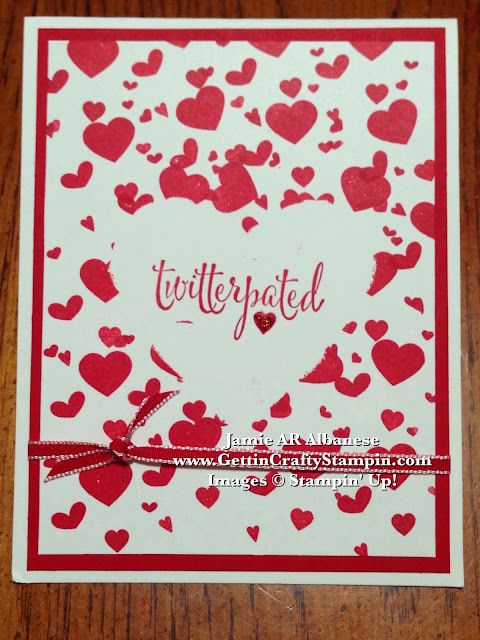 With this polka dot trend in crafting to fashion it was fun to create a cool twist on the look for this Twitterpated hand-stamped Valentine card. This fun Masking technique makes for a layered look. Create this layered look when you use a Masking Technique. Start by creating a Mask using our Hearts Collection Framelits and Sticky Notes on the Big Shot Magnetic Platform on the Big Shot Die-Cutting Machine. Cut the size you desire that will frame your sentiment. Stamp this You Plus Me (from the Occasion Mini Catalog) 'Twitterpated' sentiment in Real Red ink on the cover of Whisper White card stock. Cover it with the die-cut sticky note. Using the Real Red ink pad and the hearts from the Perpetual Birthday Calendar and stamp to give a cute look. Layer it over Real Red card stock and then onto a Whisper White card. Tie the look together with the 1/8" Real Red Taffeta Ribbon - I love how a look can come together with coordinating accessories! Remove the Mask after stamping and add a dash of sparkle with our Cherry Cobbler Dazzling Details. Oh, I LOVE Fashion!! I adore clothes, shoes and accessories!! I also adore crafting and card making! Combine your passions and find inspiration that surrounds you and in things that you love. This adorable red polka-dot dress is too cute! What fun it is to share this hand-stamped card that takes a spin on this dress. Happy Fashion Friday! Find crafting inspiration everywhere you look. With a simple technique, like Masking, you can deliver a stylish hand-stamped card this Valentine's Day (and really, this love-filled card can be delivered all year long). JOIN ME in sending hand-crafted cards out this year - this small measure of love will deliver big and lasting blessings. The Perpetual Birthday Calendar stamp set is great for use all year long on your rubber-stamped creations. The upcoming class is waiting for YOU to join us and create some love.